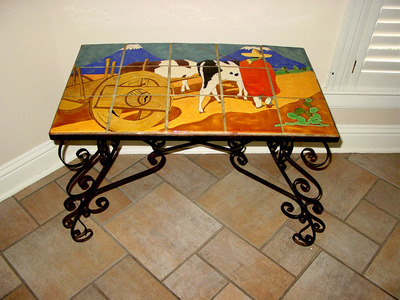 H-20 1/4" W-16 1/2" L-24 1/4"
Table top is 18 1/4 inches by 30 1/2 inches. 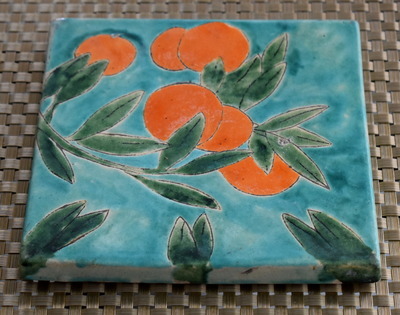 This is the large 8 x 8 inch Tile&nbsp; Wow. 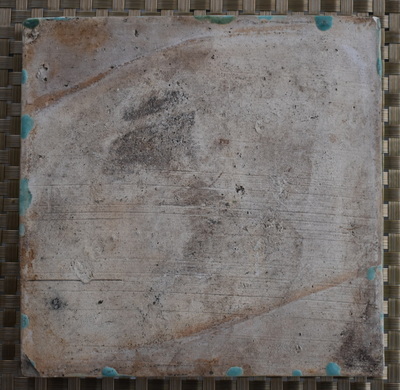 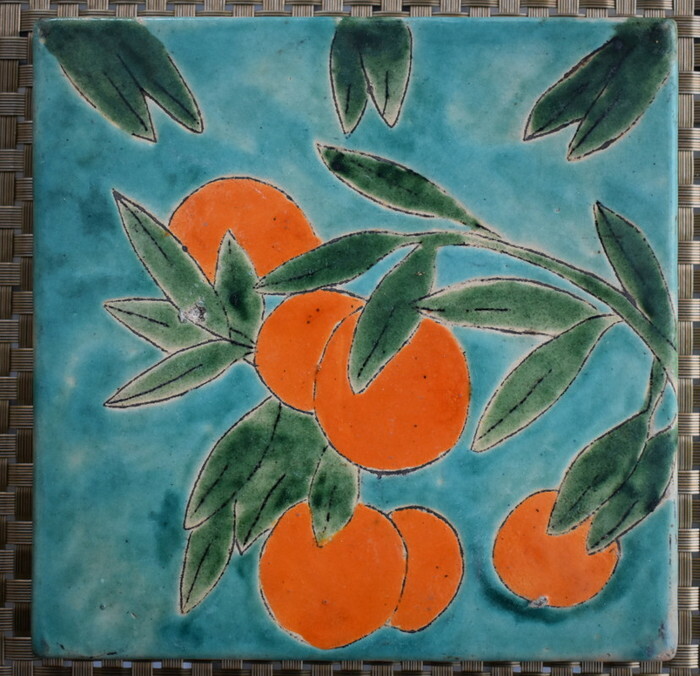 The rarer 8 x 8 inch tile.&nbsp; Kiln imperfection chip on underside of corner.&nbsp; There is glaze on the surface of the chip so we know it happened during the firing process.&nbsp; Unusual Tile. 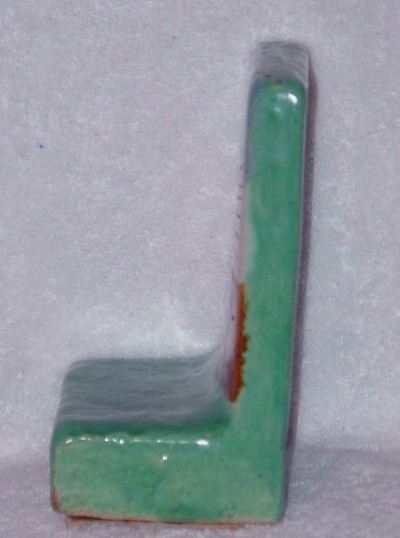 Kiln firing imperfections.&nbsp; A great smaller sized book end. 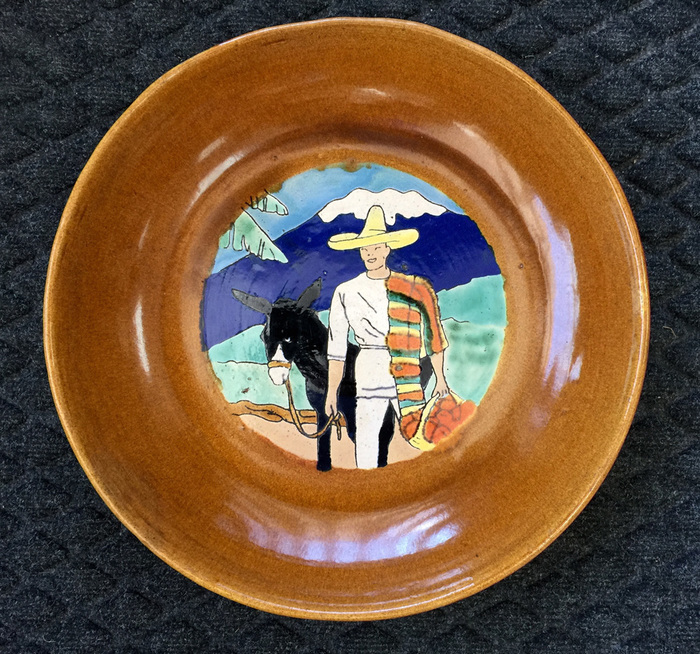 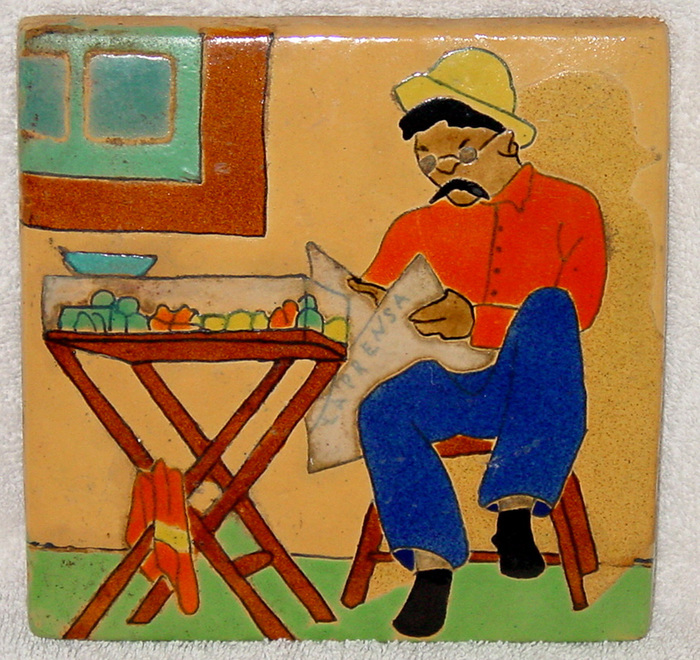 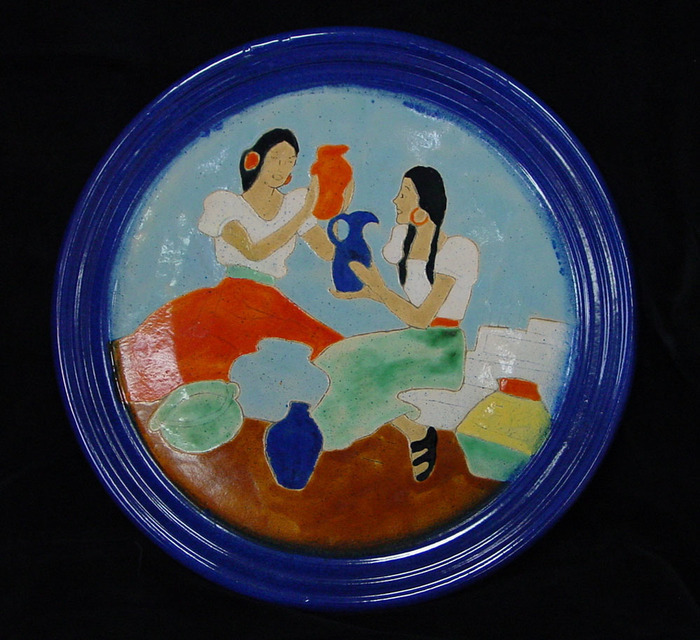 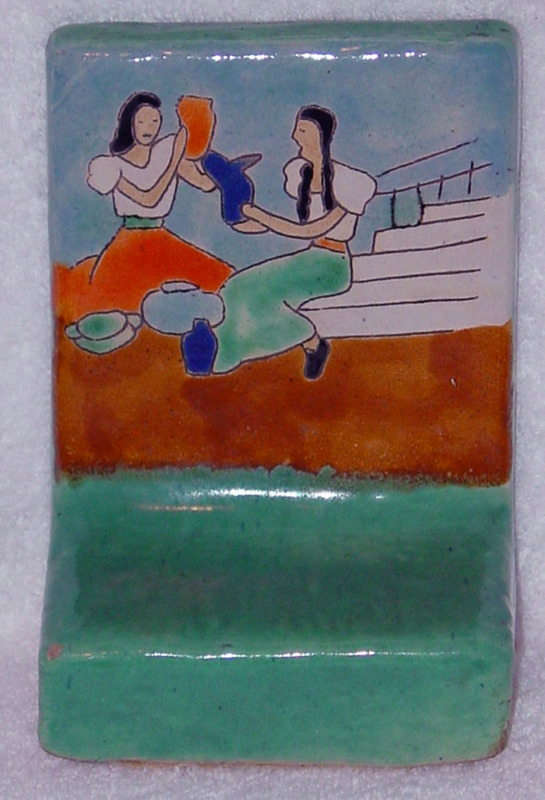 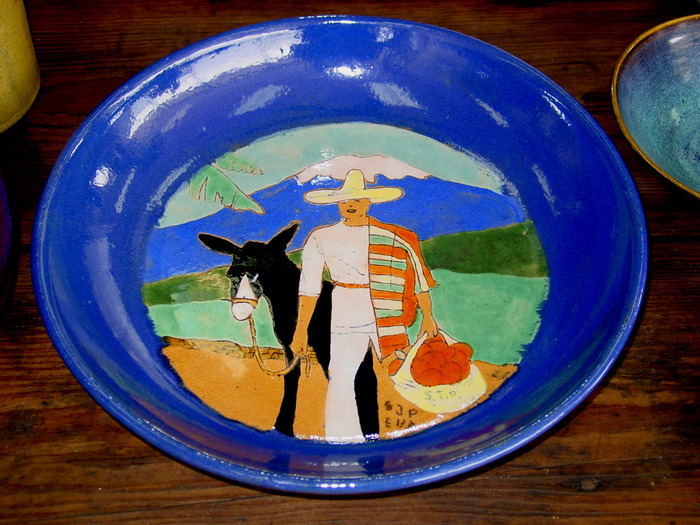 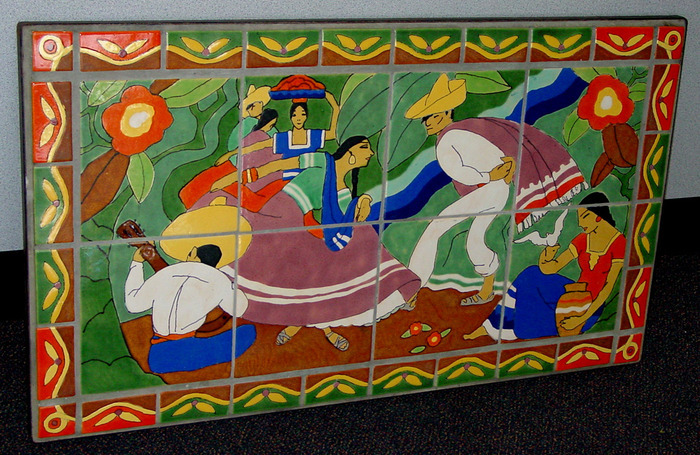 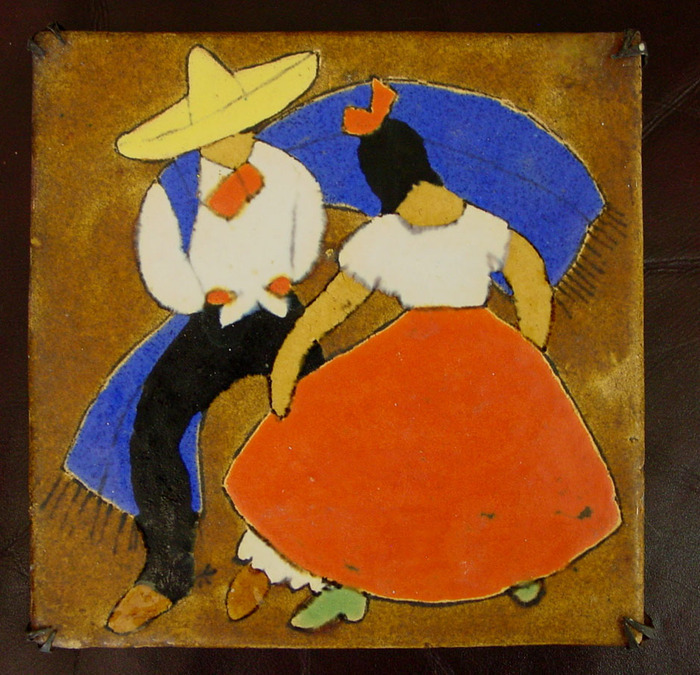 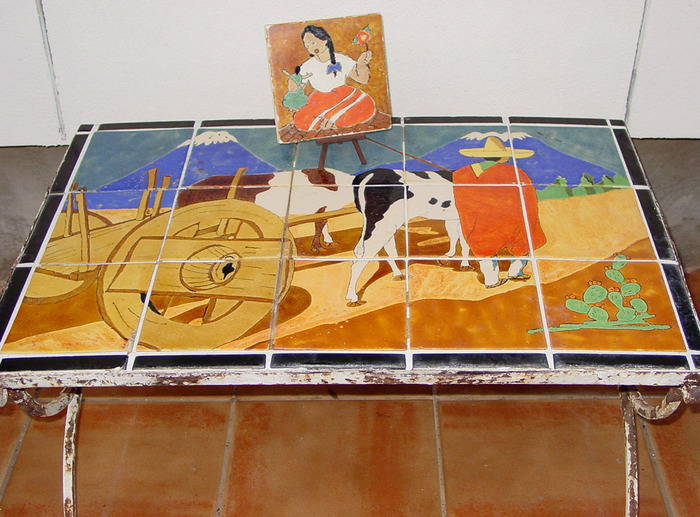 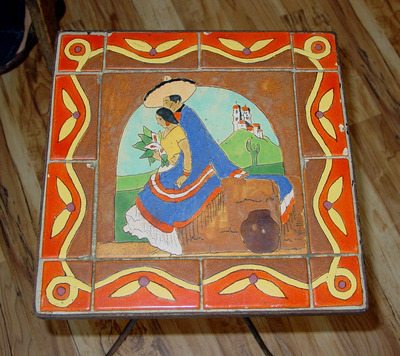 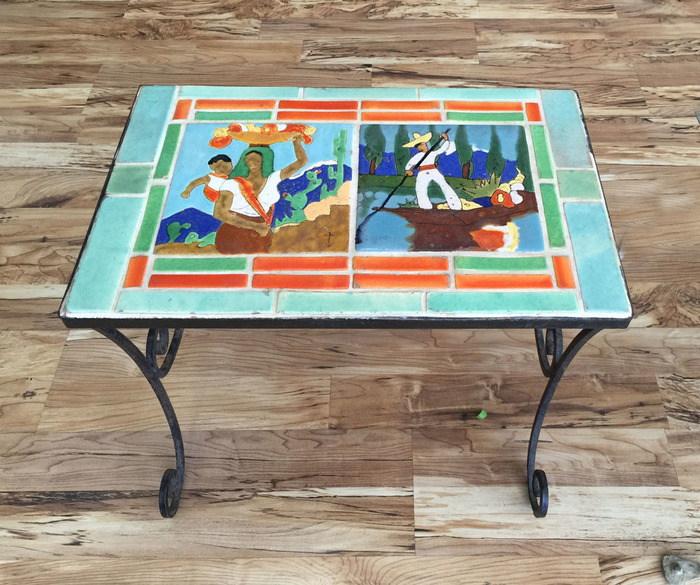 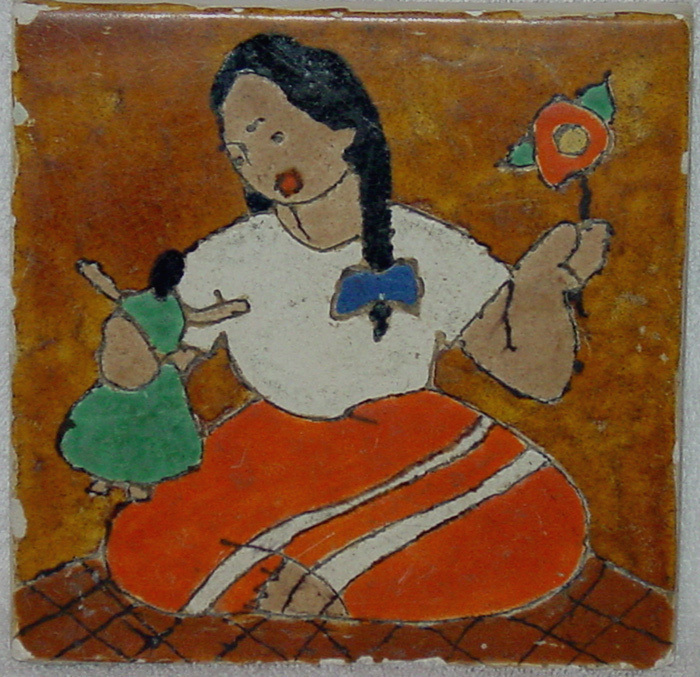 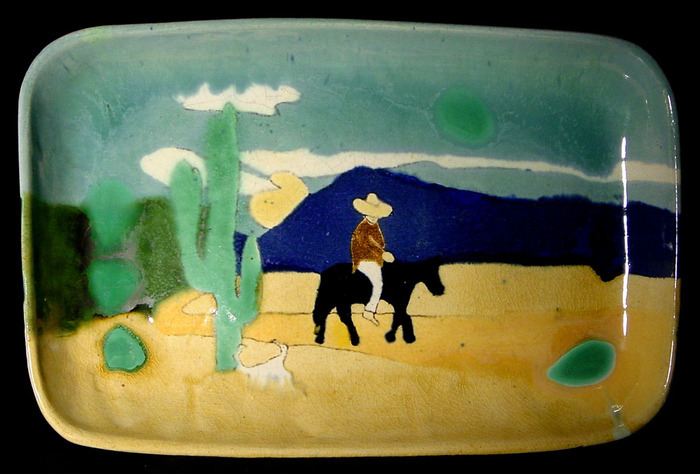 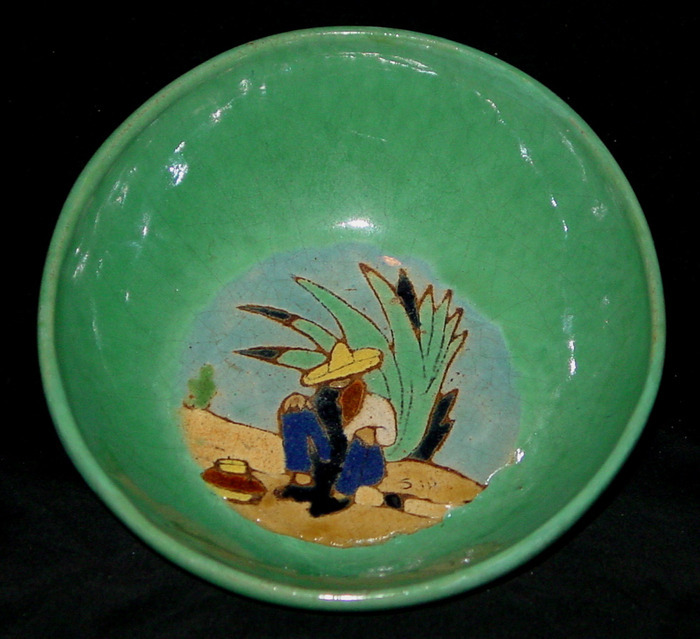 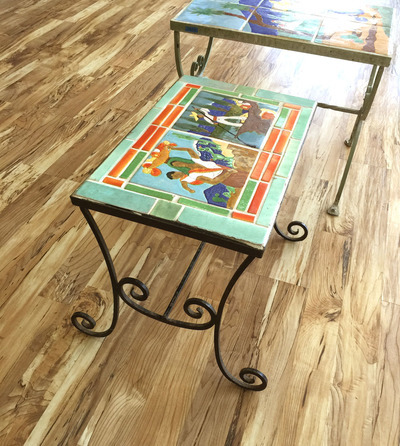 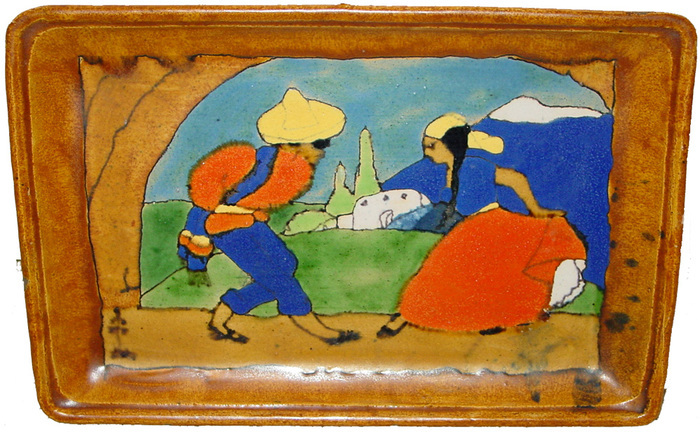 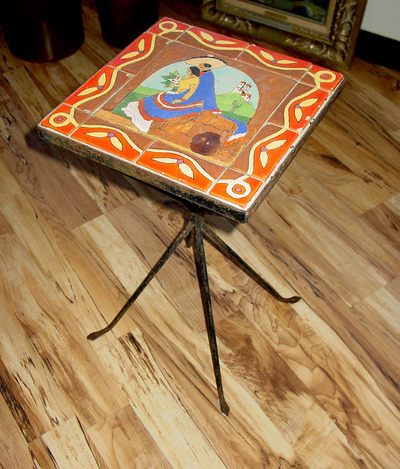 "San José" is used generically to include several makers of similar-looking art pottery and tiles made in San Antonio. 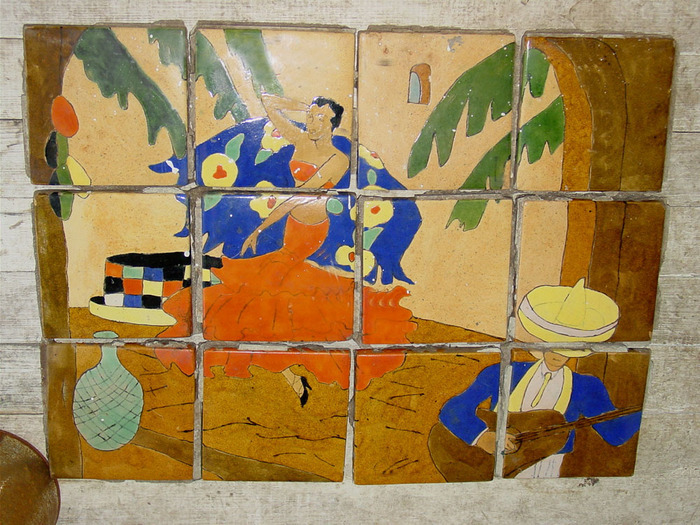 The premier workshop was Mexican Arts and Crafts, which operated downtown on the banks of the San Antonio River from 1931-1941. 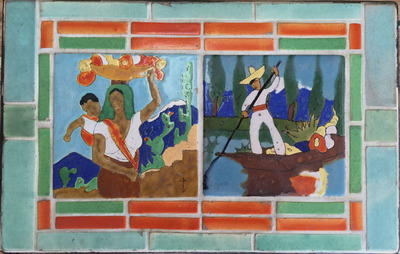 Its founder, Ethel Wilson Harris, copyrighted a book of designs in 1937 and registered her characteristic "logo" -- a maguey cactus in full bloom. 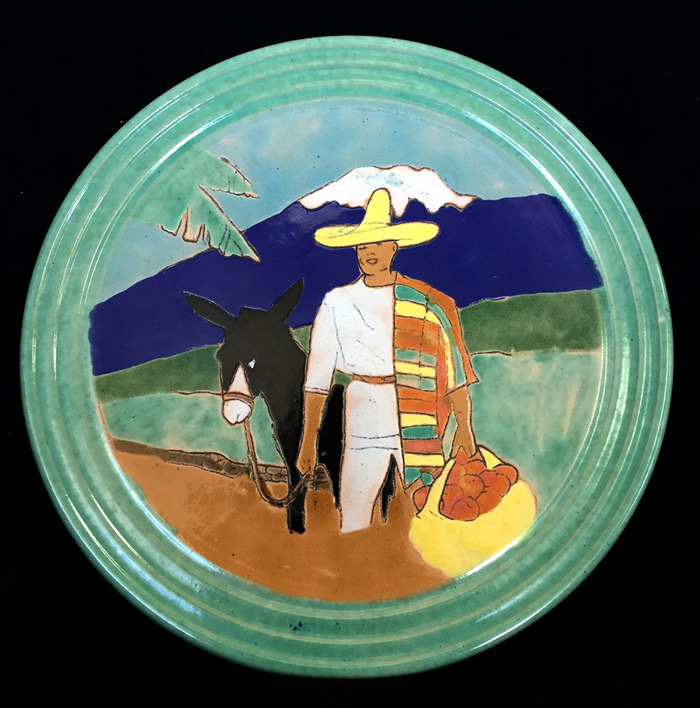 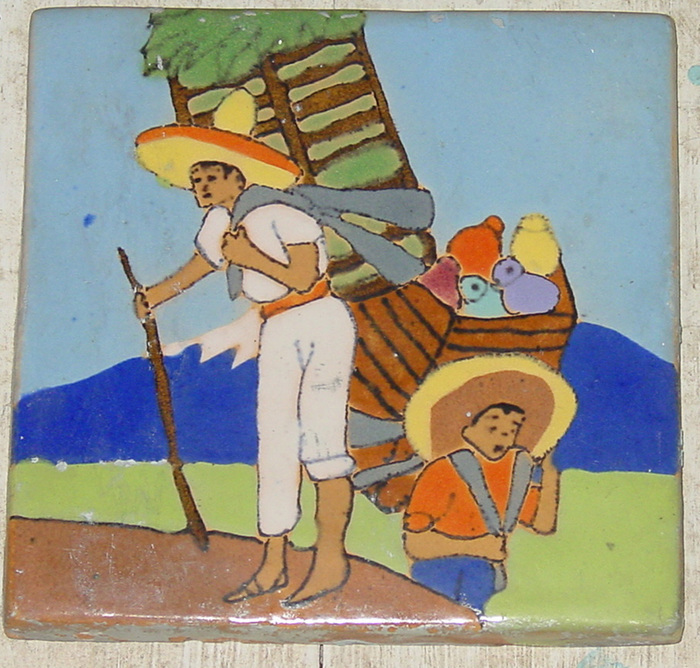 In 1941 the workshop changed its name to Mission Crafts when it moved to within the walls of Mission San José, where gifted artisans created tiles and pottery until 1977. 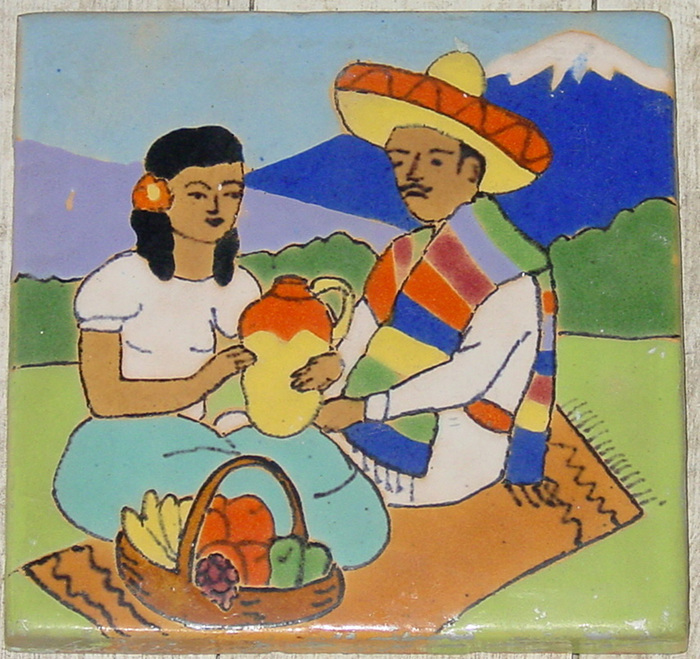 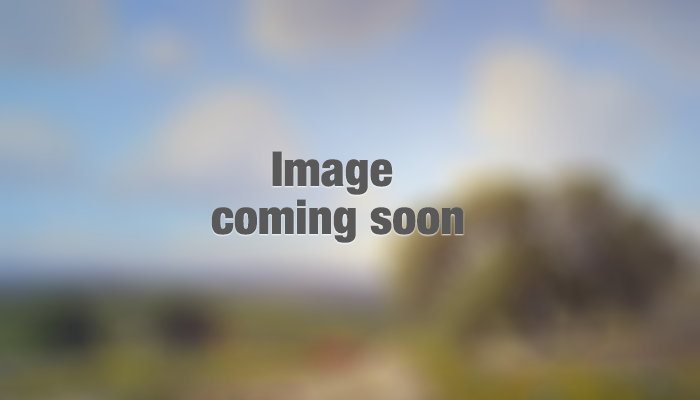 Their products are commonly confused with those of the nearby San José Potteries, which operated from 1934 to 1945. 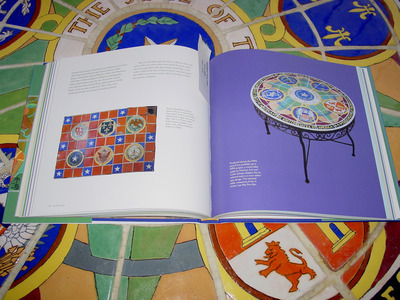 SJP executed relatively few designs in large numbers and of varying quality when it operated on its own. 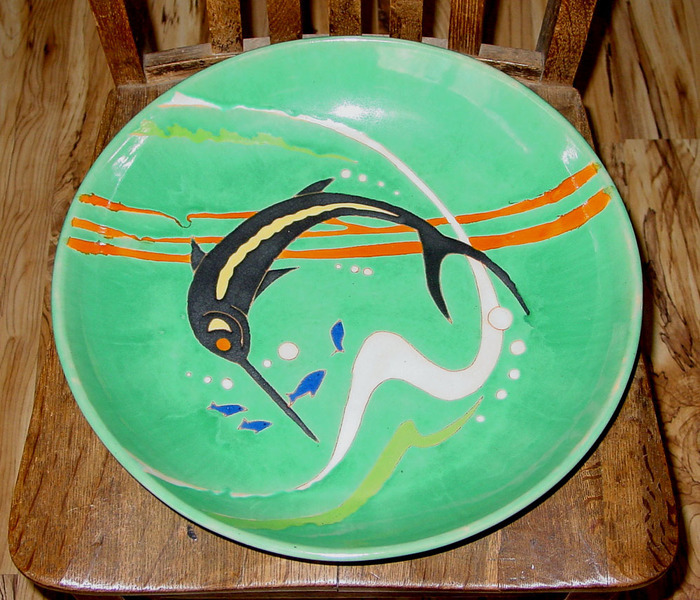 Its best work was made when the company was under the supervision of Harris, who became technical supervisor for the Arts and Crafts Division of the WPA projects in San Antonio in 1939. 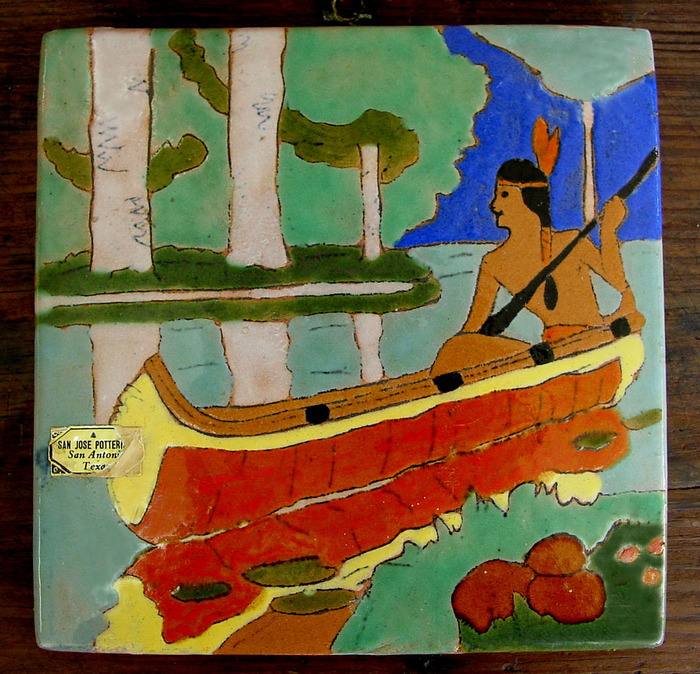 Being imitated is a sign of success. 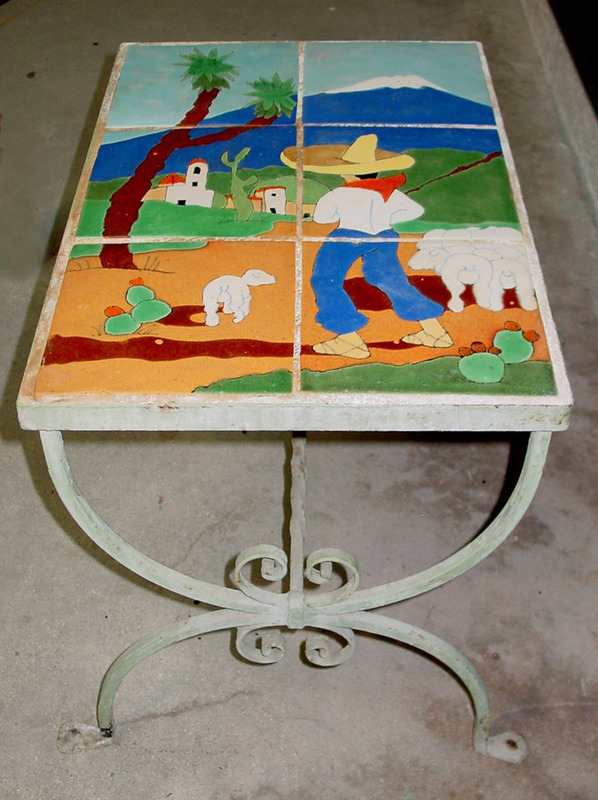 The popularity of "Mexican" designs tempted others in San Antonio to adapt and or directly copy work done in the workshops run by Harris. 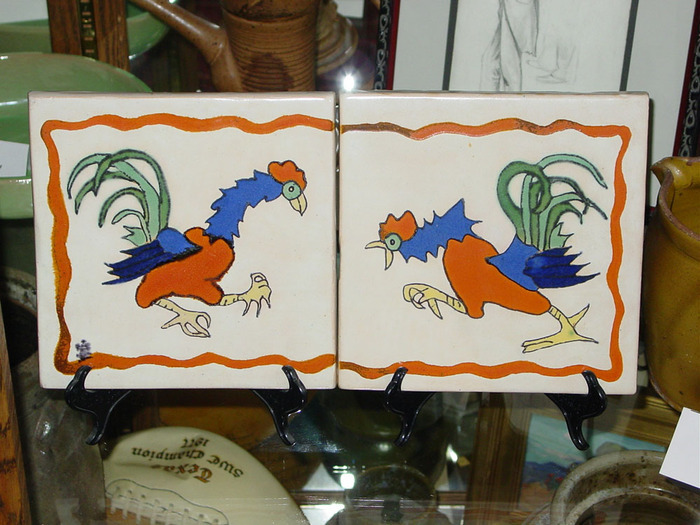 These included the potter Harding Black and an artisan named Mamie Sandoval at the Southern Company. 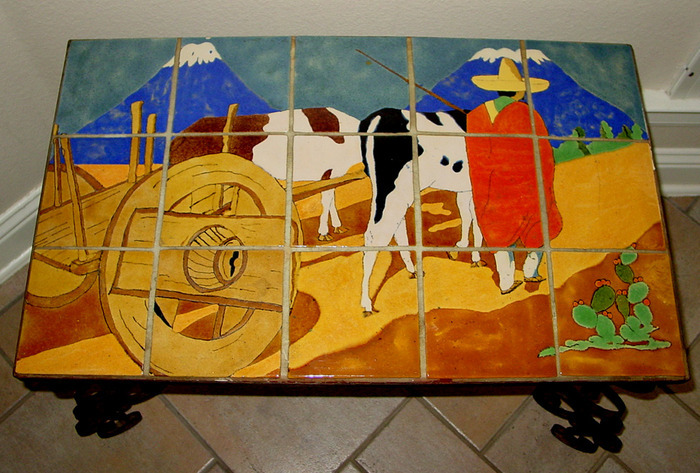 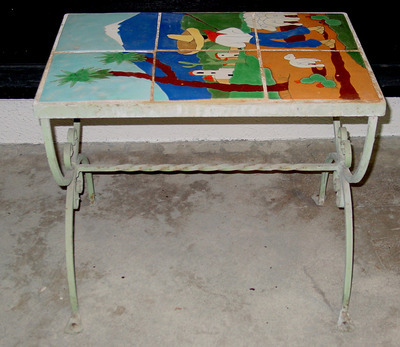 For a few years, a Mexican brick factory known by its acronym -- Ladrillera Monterrey, S.A. (Lamosa) -- produced very similar tiles and tables as well. 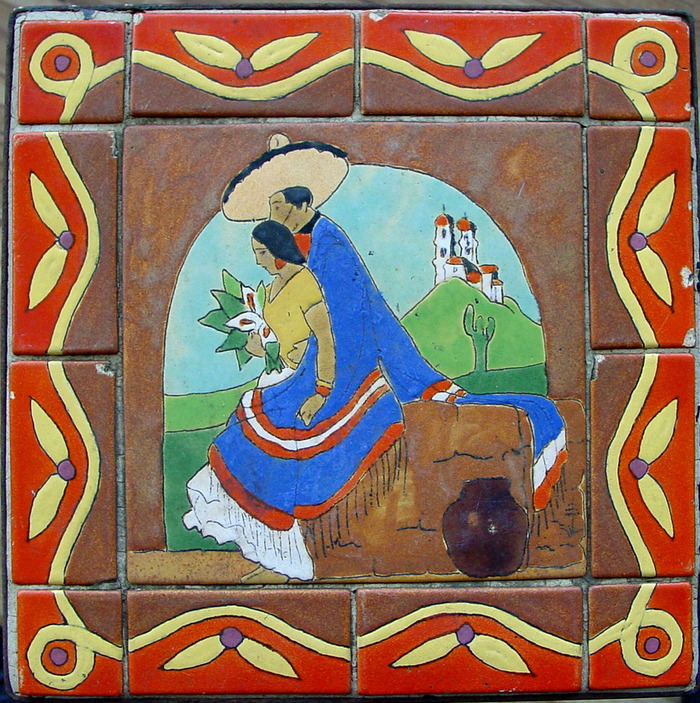 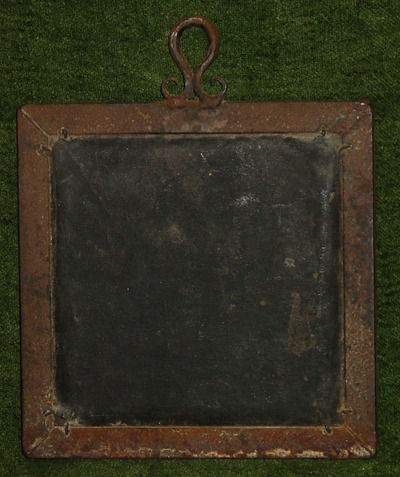 The operation was supervised by a tile technician from California who had helped establish the potteries in San Antonio. 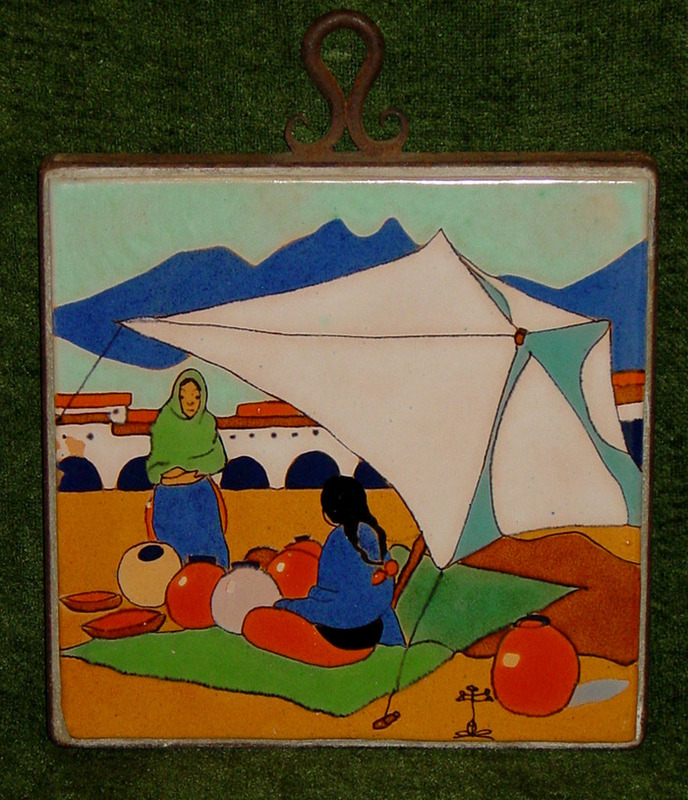 Lamosa designs were marketed in the United States and are quite collectible today. 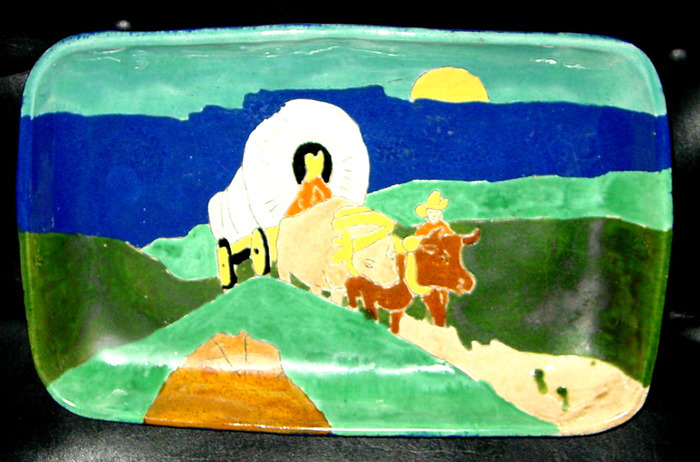 Quoted from Susan Frost Author of Colors on Clay.